انصاری, مختار, دانشجو, فرهاد, سلطانی محمدی, مسعود. (1395). بررسی تقاضای لرزه‌ای جابه جایی پس ماند پل‌های تک ستونه بتنی با المانهای فایبر مبتنی بر روش نیرو. پژوهشنامه حمل و نقل, 13(1), 34-52. مختار انصاری; فرهاد دانشجو; مسعود سلطانی محمدی. "بررسی تقاضای لرزه‌ای جابه جایی پس ماند پل‌های تک ستونه بتنی با المانهای فایبر مبتنی بر روش نیرو". پژوهشنامه حمل و نقل, 13, 1, 1395, 34-52. انصاری, مختار, دانشجو, فرهاد, سلطانی محمدی, مسعود. (1395). 'بررسی تقاضای لرزه‌ای جابه جایی پس ماند پل‌های تک ستونه بتنی با المانهای فایبر مبتنی بر روش نیرو', پژوهشنامه حمل و نقل, 13(1), pp. 34-52. انصاری, مختار, دانشجو, فرهاد, سلطانی محمدی, مسعود. بررسی تقاضای لرزه‌ای جابه جایی پس ماند پل‌های تک ستونه بتنی با المانهای فایبر مبتنی بر روش نیرو. پژوهشنامه حمل و نقل, 1395; 13(1): 34-52. استفاده از المان­های فایبر تیر-ستون پایه نیرویی، به دلیل توانایی آن در مدل­سازی پلاستیسیته گسترده در طول ستون با استفاده از تنها یک المان و تعدادی نقاط انتگرال­گیری بسیار مورد توجه قرار گرفته است ولی حساسیت آن به پارامترهای مدل­سازی و مدل­های رفتاری مصالح باعث شده است تا برآورد تقاضای لرزه­ای جابه­جایی پس ماند در این روش مدل­سازی از اهمیت خاصی برخوردار باشد. 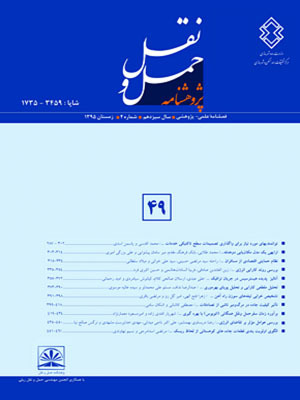 در این تحقیق تأثیر دو روش مدل­سازی با تئوری پلاستیسیته گسترده و تئوری پلاستیسیته متمرکز در محل مفاصل در طول المان تیر- ستون برای پایه پل در تخمین جابه جایی پس ماند تحت تأثیر زلزله‌های نزدیک گسل بررسیشد. در تخمین و برآورد جابه جایی پس ماند، اثر لغزش آرماتورهای طولی ستون،تأثیر پارامترهایهندسی و مشخصات مکانیکی مصالح ارزیابی شد. با توجه به اهمیت جابه جایی پس ماند به عنوان پارامتری مهم در ارزیابی کارایی سازه‌های آسیب دیده، تخمین میزان جابه­ جایی پس ماند لرزه­ای از اهمیت خاصی برخوردار است. در این مطالعه اثر روش­های مختلف مدل­سازی و تأثیر مشخصات مصالح در برآورد جابه جایی پس ماند ارزیابی شد و در این راستا 5 مدل مختلف بررسی گردید و حساسیت مدل بهینه به پارامترهای مختلف سنجیده شد. نتایج نشان می­دهد برای تخمین جابه جایی پس ماند، تئوری مدل­سازی پلاستیسیته گسترده برای پایه­های بتنی پل دقت مناسبی دارد و همچنین پارامترهای کرنش بارگذاری مجدد مدل رفتاری بتن و پارامترهای مدلسازی المان فایبر اساس نیرویی تأثیر زیادی در تخمین جابه جایی پس ماند دارند. The force-based formulation is attractive because it can model the spread of plasticity along the length of column using only one element and a number of integration points; however, their sensitivity to modeling parameters and models of material behavior has resulted in the estimation of residual displacement seismic demand to be important in this modeling method. In this research, the effects of two theories of lumped plasticity and distributed plasticity on modeling the concrete bridge column for estimating the residual displacement in near field zones were investigated. For estimation of residual displacement, the effects of reinforcing slide, geometrical parameters, and material behavior parameters were studied. Due to the importance of residual displacement in the performance evaluation of damaged structures, estimation of residual displacement is very crucial. In this study, the effects of different modeling methods as well as material behavior parameters on estimation of residual displacement were investigated. For this purpose, five different models were studied and the sensitivity of optimum model to various parameters was evaluated. The results showed that the theory of distributed plasticity for bridge concrete column has a good accuracy for estimating the residual displacement. Reloading strain parameters of concrete behavior and forced-based beam-column fiber element modeling parameters have an important role in estimation of residual displacement. - Beery, p.M and Eberhand, O. M. (2007). “Performance Modeling Strategies for Modern Reinforced Concrete Bridge Column.” PEER-2007/07, Pacific Earthq. Engrg.Res. Center, Univ. of California at Berkeley, California. - California Department of Transportation (Caltrans), 2004, “Seismic Design Criteria,” Sacramento, CA, 116 pp. - California Department of Transportation (Caltrans) (2001). Seismic Design Criteria Ver. 1.2., California. - Choi, H., Saiidi, S., Somerville, P. and El-Azizy, S. (2010). “Experimental Study of Reinforced Concrete Bridge Columns Subjected to Near-Fault Ground Motions.” ACI Structural Journal, Vol.107, No.1, pp.3-12. - Fahmy, M., Wu, Z.,Wu,G. and Sun,Z. (2010). “Post-Yield Stiffness and Residual Deformations of RC Bridge Columns Reinforced With Ordinary Rebars and Steel Fiber Composite Bars.” J.Engineering Structures., Vol. 124, No.32, pp.2969-2983. - Iemura, H., and Takahashi, Y. (2000). “Development of high seismic performance RC piers with unbounded bars.” Proc. of 1th Symposium for the Enhancement of Earthquake Performance of Infrastructures Based on Investigation into Fracturing Process, Japan. - Japan Road Association, (2002), Design specification of highway bridges:part V-seismic design, Japan (in Japanese). - Jeong, H. I., Sakai, J. and Mahin, S. A. (2008). “Shaking Table Tests And Numerical Investigation Of Self-Centering Reinforced Concrete Bridge Columns.” PEER-2008/06, Pacific Earthq. Engrg.Res. Center, Univ. of California at Berkeley, California. - Kawashima, K. (2000). “Seismic Design And Retrofit Of Bridges.” Proc. of 12th World Conference on Earthquake Engineering, CD-ROM No. 2828, New Zealand Society for Earthquake Engineering, Auckland, New Zealand. - Lee, W.K. and Billington, S. (2010). “Modeling Residual Displacement of Concrete Bridge Columns Under Earthquake Loads Using Fiber Elements.” J. Bridge. Engrg., ASCE, Vol. 15, No. 3, pp. 240-249. - Mander, J.B., and Cheng,C.T. (1997). “Seismic resistance of bridge piers based on damage avoidance design.” Report NO.NCEER-97-0014, Department of civil and Environmental Engineering,State University of New York at Buffalo, NY. - OpenSees (2008). “Open System for Earthquake Engineering Simulation.” Available online: http://opensees.berkeley.edu. - Uglade, M.Kutter,L.B and Jeremic,B. (2010). “Rocking Response of Bridges on Shallow Foundation.” PEER-2010/101, Pacific Earthq. Engrg.Res. Center, Univ. of California at Berkeley, California. - Wang,Z.,Song, W.,Wang, Yand Wei,H. (2011). “Numerical Analytical Model for Seismic Behavior of Prestressing Concrete Bridge Column Systems.” Journal of Procedia Engineering, Vol. 14, No.7, pp. 2333-2340.